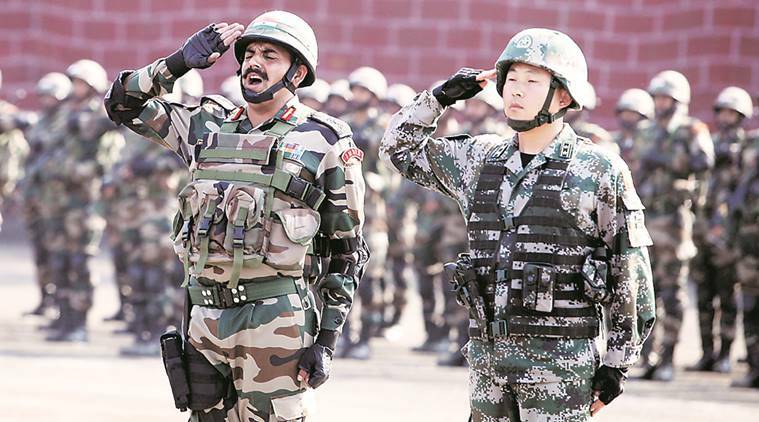 (TibetanReview.net, Oct19, 2018) – In an indication of continued warming of bilateral ties with its giant southern neighbor in a time of growing trade tension with the USA, China is to resume its symbolic ‘Hand in Hand’ annual bilateral military exercise with India in December, reported the PTI news agency Oct 18. The last ‘Hand-in-Hand’ exercise took place in the Indian city of Pune in 2016. The drill did not take place in 2017 due to the Doklam incident which saw the forces of the two counties locked in a 73-day stand-off. Doklam, adjoining the Indian state of Sikkim, is claimed by both Bhutan and China. Indian troops stepped in when intruding Chinese forces began building a road in it, acting as security guarantor to Bhutan and in view of Doklam’s strategic importance to it. During the ensuing prolonged standoff, China’s official media made repeated calls for an outright war to teach India a lesson. It eventually ended with both the sides agreeing to withdraw from the site, although China never officially acknowledged it. Rather, it claimed victory on account of India’s withdrawal. Nevertheless, bilateral ties have improved recently. Indian Prime Minister Narendra Modi held an informal summit with Chinese President Xi Jinping at Wuhan in Apr 2018. In August, Chinese Defence Minister Wei Fenghe visited New Delhi, during which the two sides decided to work towards firming up a new bilateral pact on defence cooperation and agreed to increase interactions between their militaries at multiple levels to avoid Doklam-like standoffs along the disputed border.